Good morning friends! As the holiday's approach I look forward to spending time with my family and being thankful for the blessings of love and friendships in my life. I am truly blessed! 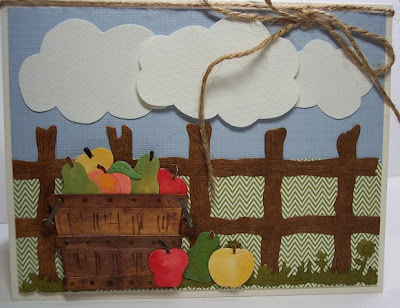 For today's card I used CottageCutz Rustic Fence and CottageCutz Fall Basket of Fruit. Nothing says Fall like a bushel of apples. Today I will shop for Thanksgiving groceries, and apples will surely be on my list for apple pies. Whether you celebrate Thanksgiving or not, I hope you will reflect on the people that are important in your life and let them know they are loved. Have a wonderful Thanksgiving! so full of fall harvest beauty. Very cute, great fall project! So cute! Loving your basket!!! Janice this is so very sweet. I just love that apple basket die. This is super cute. Janice your card is absolutely beautiful and perfect for fall!! !